It’s time for a Scope development competition! With all of the new documentation coming to support the development of Unity Scopes, it’s time for us to have another development shodown! Contestants will have five (5) weeks to develop a project, from scratch, and submit it to the Ubuntu Store. But this time all of the entries must be Scopes. Be sure to update to the latest SDK packages to ensure that you have the correct template and tools. You should also create a new Click chroot to get the latest build and runtime packages. We’ve got some great prizes lined up for the winners of this competition. Design – Scopes offer a variety of ways to customize the way content is displayed, from different layouts to visual styling. Take full advantage of what’s possible to provide a beautiful presentation of your results. Awareness / Promotion – we will award extra points to those of you who blog, tweet, facebook, Google+, reddit, and otherwise share updates and information about your scope as it progresses. Joey-Elijah Sneddon Author and editor of Omg!Ubuntu! To get things started we’ve recently introduced a new Unity Scope project template into the Ubuntu SDK, you can use this to get a working foundation for your code right away. Then you can follow along with our new SoundCloud scope tutorial to learn how to tailor your code to a remote data source and give your scope a unique look and feel that highlights both the content and the source. To help you out along the way, we’ll be scheduling a series of online Workshops that will cover how to use the Ubuntu SDK and the Scope APIs. In the last weeks of the contest we will also be hosting a hackathon on our IRC channel (#ubuntu-app-devel on Freenode) to answer any last questions and help you get your c If you cannot join those, you can still find everything you need to know in our scope developer documentation. It was less than a month that we announced crossing the 10,000 users milestone for Ubuntu phones and tablets, and we’ve already reached another: 100,000 app downloads! The new Ubuntu store used by phones, tablets, and soon the desktop as well, provides app developers with some useful statistics about how many times their app was downloaded, which version was downloaded, and what country the download originated from. This is very useful as it it lets the developer gauge how many users they currently have for their app, and how quickly they are updating to new versions. One side-effect of these statistics is that we can see how many total downloads there have been across all of the apps in the store, and this week we reached (and quickly passed) the 100,000th download. We’re getting close to having Ubuntu phones go on sale from our partners at Bq and Meizu, but there are still no devices on the market that came with Ubuntu. This means that we’ve reached this milestone solely from developers and enthusiasts who have installed Ubuntu on one of their own devices (probably a Nexus device) or the device emulator. The continued growth in the download number validates the earlier milestone of 10,000 users, a large number of them are clearly still using Ubuntu on their device (or emulator) and keeping their apps up to date (the number represents new app installs and updates). This means that not only are people trying Ubuntu already, many of them are sticking with it too. Yet another datapoint in support of this is the 600 new unique users who have been using the store since the last milestone announcement. To supply all of these users with the apps they want, we’re continuing to build our community of app developers around Ubuntu. The first of these have already received their limited edition t-shirts, and are listed on the Ubuntu Pioneers page of the developer portal. There is still time to get your app published, and claim your place on that page and your t-shirt, but they’re filling up fast so don’t delay. Go to our Developer Portal and get started today, you could be only a few hours away from publishing your first app in the store! Ubuntu phone (and tablet) users sign into their Ubuntu One account on their device in order to download or update the applications on their phone. This allows us to provide many useful features that users expect coming from Android or iOS, such as being able to re-install their collection of apps on a new phone or after resetting their current one, or browsing the store’s website (coming soon) and having the option to install an app directly to their device from there. As a side effect, it means we know how many unique Ubuntu One accounts have connected to the store to in order to download an app, and that number has this week passed the 10,000 mark. Not only is this a milestone, but it’s down right amazing when you consider that there are currently no phones available to purchase with Ubuntu on them. The first phones from OEMs will be shipping later this year, but for now there isn’t a phone or tablet that comes with the new Ubuntu device OS on it. That means that each of these 10,000 people have purchased (or already had) either a supported Nexus device, or are using one of the community ports, and either wiped Android off them in favor of Ubuntu, or are dual booting. If this many people are willing to install the beta release of Ubuntu phone on their device, just imagine how many more will want to purchase a phone with Ubuntu pre-installed and with full support from the manufacturer. In addition to users of Ubuntu phone, we’ve also seen a steady growth in the number of applications and application developers targeting Ubuntu phone and using the Ubuntu SDK. To celebrate them, we created Ubuntu App Pioneers page, and the first batch of Pioneers t-shirts are being sent out to those intrepid developers who, again, are so excited about a platform that isn’t even available to consumers yet that they’ve dedicated their time and energy into making it better for everyone. So, we have announced the Ubuntu App Showdown where you can build some awesome Ubuntu apps and win prizes such as the Nexus 7 (2013) tablet and the Meizu MX3, we have provided an update on lots of great updates going on such as refined HTML5 support and a raft of developer.ubuntu.com updates, we have revised and improved how the dash and scopes work (more developer docs on this coming soon! ), we have simplified how apps are uploaded to the store, and of course, Ubuntu handsets are hitting the market later this year so our app devs will have plenty of new users to consume their apps. But, why stop there? We are not here to build a good app developer community, we are here to build the most empowering, rewarding, and fun app developer community there is, all powered by openness and collaboration. This is a week with a range of tutorial sessions for how to build apps for Ubuntu across QML, HTML5 and more. All of these sessions take place online in a series of Google Hangouts, complete with embedded chat channels where you can interact with the speaker and ask questions. We also have a few other sessions such as a feedback session on the software store and how to get compiled code into click packages. Ubuntu App Developer Week is available freely to anyone who chooses to join. You don’t have to be an expert, and you don’t have to know how to write apps with the Ubuntu SDK yet. Beginners are very welcome! All of the sessions, their times, and how to join them are available on the Ubuntu App Developer Week schedule. Just show up at the right time, click a session, and you are ready to go! We still have some slots free if you want to volunteer to run a session. If you would like to, please email Michael Hall. The fun starts next week on Monday 3rd March at 2pm UTC and runs all week. We hope to see you there! The focus on content is a core principle that drives how we build Ubuntu. This not only includes getting the clutter out of the way and maximizing your view on your content (such as integrated window borders and overlay scroll-bars), but it also includes searching for, browsing, and consuming content as easily as possible. At the core of this latter approach to content is the Ubuntu dash and the scopes that power it. For those unfamiliar with this technology, when you tap or click the Ubuntu button on your Ubuntu computer, smart-phone, or tablet you currently see a number of different views such as Home, Apps, Music, and Videos. Within these views we have a series of “scopes” that deliver both online and offline content. As an example, in our music scope we show music on your computer/device as well as music available to download or purchase online too. All of this integrates search right into the heart of Ubuntu; no longer do you need to open up a software store, music app, or video app to access content you either own or would like to aquire…it is all integrated into the core of Ubuntu. Ever since we released this technology we have been evaluating the feedback from our users, through formalized user testing, as well as input from content providers who are keen to deliver content via these services. We have reviewed all of this feedback and made a set of changes that improve and refine how the dash and scopes work, and we want to share some of those updates here. This post does not summarize all improvements we are making; we have other refinements in store, and we will provide those updates closer to the time. All screenshots in this post are of working code on the phone and tablet, much of which you can see at MWC this week. This technology will also be coming to the desktop at a later date. One of the constraining aspects about our previous dash was some of the limitations in terms of how scope results are presented to the user. Ubuntu users will be very familiar with a search resulting in the same visual structure of how results appear, which you can then click a result to see a preview view with more details. We have refined and improved this by building a “dash toolkit” that can be used to customize how results are displayed now. In our previous dash the notion of scopes were something that the Ubuntu development team were primarily involved in – we would ship a number of scopes switched on by default and the user could enable/disable those scopes where appropriate. In our new dash we are treating scopes almost like in-dash apps; that is, a scope is something a provider can ship to users and the user can enable or disable the scopes that are of most interest to them. This makes the dash infinitely pluggable, more tuned to the user’s needs, and combined with the customization of how results are displayed, it makes the dash far more compelling for both users and content providers. This range of scopes is delivered by the Scopes store which provides a range of categories and available scopes. As an example, if you are a Grooveshark fan you can head into the Scopes store and add the Grooveshark scope and now your search will return Grooveshark content. Let’s take this new technology for a spin to demonstrate how it works. This scope is pulling together a variety of online components in a customized view and can be shipped as a scope that you can install on your computer or device. Here we can select a scope easily and install it by tapping it. 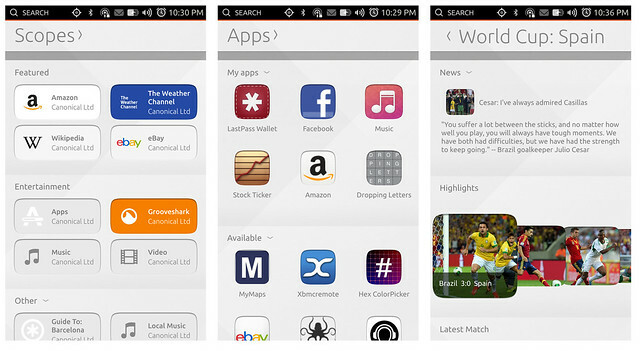 This technology is going to be arriving for Ubuntu for smart-phones and tablets in the next few weeks. Those of you using Ubuntu for devices can expect to find it as part of a norma system update. For the desktop this technology will arrive at a later date when converge our Unity 8 platform on the desktop. We expect this to be around the time of Ubuntu 14.10 – Ubuntu 15.04. This new technology opens up a wealth of opportunities for developers. Over the coming weeks we will be providing a full tutorial, API documentation, quick-start guides, and more on developer.ubuntu.com to help you get stared building and deliver scopes to users. We will announce when this content has been released on this blog. Why did you change the dash and scopes? Based on feedback from our users, through formalized user testing, and input from content providers, we wanted to make a series of improvements to refine how the dash and scopes work. When can we expect this technology to arrive? We expect these improvements to be landing in the Ubuntu for phones and tablets images in the next few weeks. How can I enable/disable scopes? You determine which scopes are searched by adding them to (or removing them from) your favourites list. Even if a scope is not in your favourites list, you can explicitly navigate to that scope and start a search, without adding that scope to your favourites list. So, you are in complete control at all times of which scopes are searched. What security/privacy measures are you putting in place with this technology? While we will ship with a set of default scopes, the user can switch of any scopes if they choose to do so. Each scope runs as a separate process in its own sandbox, secure via AppArmor. The sandbox is enforced at the kernel level, so it is impossible for a scope implementation to break out of the sandbox (for example, by making system calls directly). Scopes that are installed in the device have exactly one of two possible AppArmor profiles: network access or file system access. If a scope can access the network (for example, to retrieve email headers from a remote imap account), that scope cannot access the file system. Conversely, if a scope can access the file system (for example, to search for locally-installed media files), it cannot access the network. This prevents a scope from retrieving sensitive information from the file system and then shipping it out via the network to some remote server. Scopes are also prevented from accessing each others’ network endpoints. This means that a scope installed on the device cannot send queries to other scopes on the device in an attempt to collect private information. What languages can I write these scopes in?